Another good one - shared by a co-worker. A scientist and a Jamaican were traveling on a plane. The scientist begins to brag about how smart he was and could out smart any one. The Jamaican replied "that good fi you boss" The scientist kept on talking while the Jamaican ignores him. Finally the scientist ask the Jamaican if he wanted to play a game. The Jamaican asked what was the game about, the scientist replied "I'll ask you a series of question and for each wrong answers or if you don't know the answers all you got to pay me is a dollar, you will do the same ask me questions however, if I don't know the answers I'll give you 1000 US dollars". Feeling so sure of himself the scientist ask the Jamaican to go first. The Jamaican smiled and asked the scientist "what has three legs take 30 minutes to climb a coconut tree but only take three seconds to climb back down". Not wanted to lose the scientist ponders while the Jamaican enjoyed his peace and quiet for the rest of the flight. At the end of the flight the Jamaican stretched out his hands to the scientist, pockets his 1000 dollars and started to walk away the scientist said "I'm just curious what's the answer". The Jamaican replied "how the hell me mus know dat, nuh you a di smart scientist"
Hey Wellesley, That was a good one man!! I loved it! Lol I am going to share it. Intellectual brilliance is no guarantee against being stupid. I think this is very smart. Not only did he collect the winnings; but he was able to finish his journey in peace and quiet! Good one! Only a Jamaican could have pulled this off we are mart people. Street smart we say! ONLY A JAMAICAN. 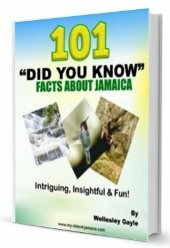 I found the one about how to tell a true Jamaican to be funnier. Jamaicans are always trying to outsmart people, like anansi; probably that's what we learnt from listening to so many of those stories. Yes, just because you have been to uwi does it means that you are super intelligent. It just means that you can take in and remember what you are taught. But there are a lot of uneducated people out there that are highly intelligent but only in that what they have grown up with. So there are a lot of that 'Jamaican' about. That's a good one.guess the jamaican was the smart one after all.